Rev. John Herzog was appointed Superintendent of the Lutheran High School Association of Greater Detroit beginning July 1, 1989. He married Marlene Federwitz in 1968. They have been blessed with two sons, David and Scott. Dr. Herzog completed the doctoral program at Wayne State University in May 1990. He has a Master of Divinity from Concordia Seminary, Springfield, Illinois, and a Master of Arts in Public Administration from Sangamon State University, also in Springfield. Prior experience includes administration responsibilities in a large child welfare agency with a special education program, and secondary teaching in Springfield at an academy and in Chicago at Lutheran High School South. He helped to develop the Christian child care philosopy known as “A Positive Expectany” currently in use at a child care agency in Iowa and Illinois. Rev. 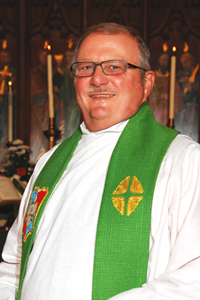 Dr. John Herzog joined the Cathedral Ministry of Historic Trinity Lutheran Church, in Detroit, as an assisting pastor in the year 1988.